How To Choose The Best Gaming Mouse At A Cheap Price | GUI Tricks - In Touch With Tomorrow! How To Choose The Best Gaming Mouse At A Cheap Price - GUI Tricks - In Touch With Tomorrow! 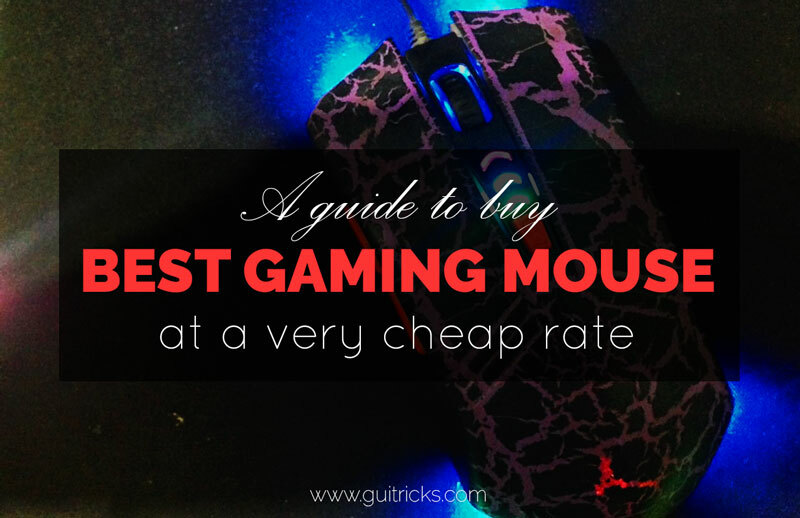 As an ardent gamer, you must know the value and importance of a great gaming mouse. A gaming mouse allows you to navigate your player when you are looking to play those favorite first person shooter games of yours. Ordinary computer mice won’t be able to provide you with the smoothness of action when you are looking to have effective control over your gaming action. It is a well known fact that not having a perfect gaming mouse can seriously undermine your overall gaming experience. Therefore you should focus on getting a well designed and highly effective gaming mouse even when you want to stick to only budget products. Numerous companies offer smart and stylish gaming mouse with good speed and additional features that come at cost effective prices and you should take your pick from them. There are a number of things that determine the goodness or effectiveness of a gaming mouse. Here are some things that you need to keep in mind while getting a high performance gaming mouse for yourself. Weight – The weight of the mouse depends on the material it is made of. Typically, good quality cheap gaming mouse products are quite lightweight. DPI – DPI or dots per inch is a measure of the sensitivity of a mouse. Higher DPI naturally means that a mouse is efficient at detecting and promptly reacting to minute and smaller movements; such features make it a great gaming mouse. Buttons – A mouse having more buttons naturally means that it is packed with more options. Usually the best mouse products in the market will come with many buttons. Many mouse products come with the feature of programming the buttons as function keys. Such features can highly increase the usability of the mouse. Lighting – The light is a feature that allows a player to navigate the mouse when it is dark. Additionally, it also makes a mouse look cool therefore it is a must have feature for a gaming mouse. Wireless – While some players like a wired mouse, there are those that prefer a wireless one. A wireless mouse can be connected easily to a PC via Bluetooth or Wi-Fi. Laser or optical – A mouse can either be laser or optical. The main difference between them is the source of their light. An optical mouse uses LED light whereas laser mouse uses a laser. Most players agree on the fact that the ultimate option for an excellent gaming mouse is of course a responsive optical one. If you are looking for cheap gaming mouse, you must know where to find them. There are many top notch gaming mouse products out there in the market. Learning about them in advance will help you to make the best choice when you are looking to get the finest product at the most cost effective rates. The Redragon M901 PERDITION is truly one of the finest gaming mice available on the market that is available at cheap prices. Equipped with 19 programmable and smart buttons, the mouse offers enhanced flexibility to players so that they may program different types of features on them. The mouse offers enhanced freedom to gamers when they are looking to exercise greater control on their gaming experience. With the Redragon M901 PERDITION, you can also kiss your keyboard goodbye and carry out all functions using the mouse only. The universal form of the mouse allows players to play all kinds of games, whether it is GTA, DOTA, NBA Live, CS or anything else. The Logitech G402 Hyperion Fury is one of the cheapest gaming mice that are available in the market. However, it is also packed with a wide range of features. The design of the mouse is comfortable and ergonomic. The small weight of the device makes it easy for players to handle it conveniently. Moreover the ideal positioning of its buttons make it even easier for the gamers to have smooth control over their gaming experience. Its highly sensitive Delta Zero sensor together combined with the 32-bit ARM processor can provide with high speed and precision that can effectively blow away your gaming rivals. Easy DPI switching along with 4000 max DPI can ensure success with most games. If you are looking for an amazing yet remarkably cheap gaming mouse to play first person shooter games, then you should definitely opt for the Corsair Gaming M65 Pro as it comes with the design that is just perfect for those games. The sniper button of the mouse is designed especially to aid gamers in ruling the battlefield. The mouse also allows gamers to lower the DPI with the press of a button. This allows for high precision gaming each and every time.